well, I was going to omit it but I guess being based on an actual "high-level" language is a plus (automatic resource management and the existence a reasonable set of data structures in the standard library come to mind). It seems to me that Flash is the proverbial elephant in the room for this query but I'd very much like to see different answers based on all kinds of languages or SDKs. 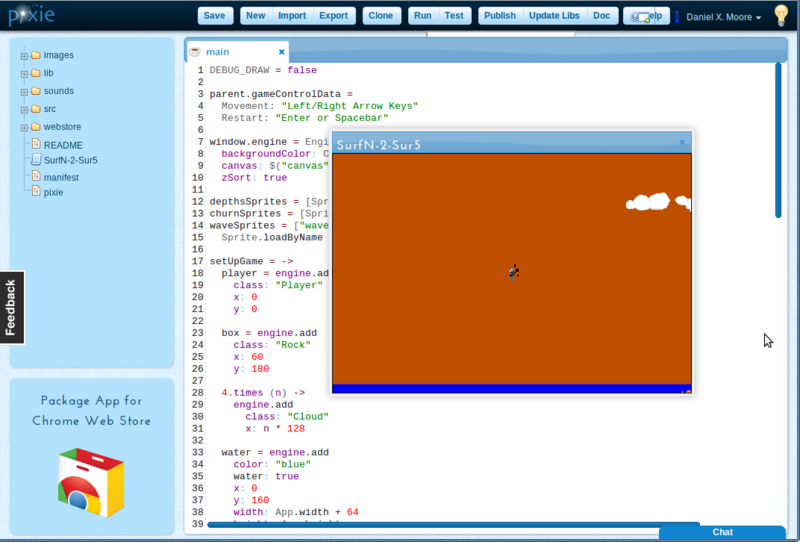 Pygame is a wrapper around SDL, a cross-platform 2D graphics library. Pygame also has wrappers for sound, music etc. Note that despite Python being a high-level programming language, pygame is (for the most part) a fairly low-level graphics library. Angel (C++) and AngelXNA (C#) are worth looking at. Adam Atomic's Flixel is also worth mentioning. A simple, modern, bare-bones game engine written in Flash. You can learn it in minutes, not days. And using Flash (or Processing/Java) keeps you from one of the most dangerous pitfalls of prototyping: You can't use the prototype's code on any serious platform. It's the game you want to prototype, not the code. Minimal setup required. You can have something onscreen in 30 seconds. Can dip into Java any time for stuff like collections, but a lot of the drawing, animation and interaction syntax is much less verbose than straight Java. Anything you write will be compatible with Processing.js, so you can work with it anywhere you have a modern browser. I used Game Maker as main tool, but I had a issue with YoYo Games (I will not explain here now), then I found Novashell. Novashell is REALLY a prototyping tool, it was made by the person that also made "LORD" (Legend of Red Dragon) and "Dink Smallwood" so he could make games fast for Ludumdare (a 48h gamejam competition), it has a map editor, supports LUA scripting, is made in C++, has zlib license (meaning that you can do whatever you want with the source, short of claiming that you invented stuff that you did not), and has a physics engine (Box2D), particle system (Linear Particle for ClanLIB), supports MikMod and Fmod, works in Linux, Mac and Windows, is dead easy to use, and you can ask stuff to Seth! Game Maker is very cool, it basically does everything you've described. It has drag and drop icons for beginners and code for advanced users. However, after having used C++ exclusively for over a year, going back to Game Maker was... painful. Check it out, hopefully you might find something there. cocos2d which uses pyglet. I use these two Python libraries extensively for prototyping. Much easier to work with than pygame. I'm surprised it hasn't been mentioned yet! I'd recommend Scirra Construct for beginners and quick prototyping. The game engine itself is abstracted, so you can focus on your game entirely. Plugins enable additional functionality, the "code" is made of draggable event, condition and action blocks etc. Construct is under active development and has an active community as well. The Scrolling Game Development Kit version 2 is the second major iteration (rewrite) of a game development IDE and framework for exactly this kind of prototyping and simple 2-D game development. As the second iteration, it takes advantage of modern languages (C#) and technologies (reflection on custom code) as well as working out some of the fundamental flaws in the design (now it allows you to place sprites directly in the map editor rather than only a path which must be externally connected to a sprite, and it doesn't try to be quite such a Wysywig editor because there are some things you want to happen at run time only and others you want at design time only). The vast majority of the framework code is exposed and editable within the IDE. If you don't like the way the "PushTowardSprite" built-in function behaves, you can bring up the editor and change it, or add your own that will appear in the list right along with all the built-in commands. You mentioned the ability to draw polygons. This framework is based on OpenTK, which is a .NET wrapper around OpenGL. So you have all the power of OpenGL at your fingertips. There's a single class "Display.cs" in the framework code that you can edit within the IDE do add whatever drawing features you want. Much of the framework is targeted as side-scroller physics (walking on slopes, riding platforms, etc), so a lot of that code is already done for you; of course you can customize or ignore it for other 2-D game types. A Tetris game has been written with it. Alpha translucency can be embedded in the graphics or applied to the drawing of any graphic. All project data is saved in a single XML file (a .NET dataset). External editors can access the file thereby extending the features available in the IDE if necessary. Projects are compiled first to C# projects (compatible with Visual Studio) and then to EXE files (with all the resources embedded). If necessary, you can load the project into Visual Studio for enhanced debugging or code development interface. With PreviewLabs, a company specialized in rapid prototyping, we're often using Unity3D to prototype 2D Games. The paid versions also work for iOS and Android, allowing you to see how your concept would work on a different platform. It comes with a physics engine, which you can also use when prototyping 2D games. The Slick Framework written in Java is a good choice. It's what I first used to learn to program. The benefits are it runs cross platform, can produce applets for the web, and has fantastic tool/library support through Eclipse or whatever else the Java environment has. That said I eventually switched to Flash simply because if you want to distribute your games there's nothing easier or more effective. I started using FlashPunk for my first game development project, and so far it has been really slick. It is a Flash library built for game design. It is a bare-bones game engine similar to Flixel, but is more like GameMaker, being more user-friendly to beginners than Flixel. FlashPunk along with the Ogmo Editor make it very efficient to get right to level design without having to spend a lot of time on coding. More info about all three of these can be found at the Flash Game Dojo. I'll second the mention of Game Maker. I would say, if every game engine falls on a continuum from "easy to use/learn but limited in what you can do" to "really powerful, but takes a long time to master"... Game Maker is pretty much the definition of the easy-to-use extreme. As Cyclops says, most basic functionality (sprites, creating game objects, movement, collision detection, scorekeeping, etc.) are drag-and-drop icons. It actually does include a fairly robust scripting language you can use too, once you start getting good... but when you start writing your entire game in their embedded scripting language, maybe it's time to "graduate" to a scripting language like Flash or PyGame. Still, I've had great success with Game Maker as a beginner, no-programming-needed tool for game design students, and can't recommend it enough. I'm a very beginner in game making, and I was impressed to manage to make something out of pygame so quickly and easily. Python + SDL = easiness assured. Well, if it's for prototyping you don't really need a slick back-end with resource management and stuff like that. As long as you can load graphics and display them you're mostly set. I'm going against the grain and propose 'write your own'. You will lose zero time figuring out how to use someone's api. If write-your-own is really not an option, DirectX comes with a sample framework that provides most basic services. Not being bound by a framework means not losing any time following its rules, and not being limited by its scope. I've been prototyping as a job, and my fastest results were when I could just bash in code without having to worry about, or being hampered by, a framework. A 2D wrapper really needs no more than loading images and being able to display them at x,y - possibly with scale, rotation and if you want to be trippy, shader. The rest you can code as you need. For a prototype that is - the code won't be nice. Torque-2d by GarageGames is a great game engine with a great community, some really impressive add-ons, and built-in support for Windows, Mac, and Wii, and even the iOS (on separate license). It costs $99. Unity3d (you can develop 2d games on it) is another very good high quality game engine with a relatively low barrier to entry. Again, great community, and really cool multi-platform support, including iOS and Android, in addition to Win/Mac, Wii, Xbox, Playstation, and the web. A great iPhone centric game engine is cocos2d for iOS. HGE Seems Great.It have Particle Editor,GUI Editor,And used by pro programmers. It's a fairly high level language and has recently been expanding its mobile support. PixieEngine is a web based IDE and game development environment. It uses CoffeeScript for scripting and provides a built in editors for pixel art and sound effects. I've tried a few other weirder ones too. Alice is a 3D game / dev environment which is open source - looks kind of clunky. Scratch, from MIT Labs, is free and really basic 2D, aimed at getting kids into coding. Visually clunky. Flexible though. Going waaaay back to Papert's LOGO, Microworlds JR lets you write in logo, allegedly. Needs an update to be useful, IMO. For me, so far, it's coming down to Construct 2 vs Stencylworks...though I'll check out how easy it is to build a decent 2D game in Unity, as I know and like Unity. FlatredBall It's free (not open source) 2.5D (2d with 3d primitives) game engine for XNA and Silverlight. More in features. Not the answer you're looking for? Browse other questions tagged 2d prototyping or ask your own question. A good way to prototype game ideas? Is HTML5 and Canvas good for rapid prototyping of games? Recommended method towards making custom maps for a 2d game? Does a basic game engine prototyping tool exist, for common game types? Recommended graphic software for creating great graphics in game?